A while back, I extracted some (what I assume to be) elemental cadmium from a few NiCd batteries, which came in the form of a very crumbly gray powder on a steel mesh plate. Now, cadmium's pretty toxic, and a toxic metal powder gets me worried. So, I've decided to try and melt it. Cadmium melts at approx. 321 degrees C (src: Wiki), which sounds doable with a hotplate and a small, steel crucible. However, I was unable to melt it with a blowtorch, instead turning the powder brown and even more crumbly (what I assume to be the oxide). So: Is there any good way to 'coerce' this metal into melting better on the hot plate? I'm no stranger to melting metals, but this has got me flummoxed - and I really kind of don't want to open yet another NiCd battery. Obviously melt it in an Argon atmosphere. Concerning what you were doing, do not work without a fume hood when dealing with the oxide particles. Melting Cd under KOH gives very good results and avoids oxidation. It also removes impurities (Zn, Pb, etc). 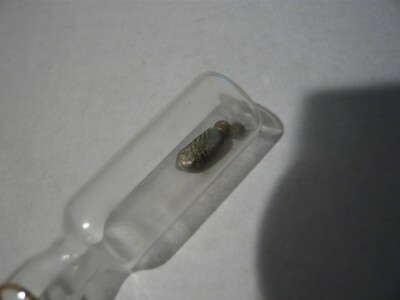 It should be possible to obtain quite pure Cd lump metal by electrolysis of molten anhydrous CdCl2 (MP = 564 C). The formed molten metal will sink to the bottom, nicely protected from air by the melt. On cooling a solid Cd regulus could then be recovered. I did this a long time ago with pure PbCl2, it worked a treat. There are lower melting eutectics with other salts out there too (I posted some information on that on this forum some time ago). I've had this on the drawing board from some time now but toxicity of Cd compounds and general volatility of molten ionic halides requires serious precautions. This sounds interesting, I'll have to try it. Results are inconclusive - the mixture thus far has turned brown, even as the KOH melted. Ideas? It was in a steel container, on a Corning hotplate set to "3" (just turned down to "2") if that helps. How much are you treating this way? A very small amount - perhaps half a cubic centimeter, or about 4 grams. Sounds too "mushy" to heat in air. Try adding a strong reducing agent (alas, I don't know what to recommend other than carbon and a lot more heat -- mind the fumes -- zinc will ruin the purity). Electrowinning may be the way to go. Should be able to isolate it nicely in a two chamber cell, CdCl2 in one, HCl in the other (graphite anode, mind the Cl2 gas; or use sulfates and PbO2 or Pt anode). You'll have to look up which plating agents are good for cadmium; regular old thiourea might work, or you may need something stronger. Carbon could work. Over in the 'lead cleaning' thread they mentioned a eutectic of CaCl2, KCl and NaCl - would this do any good? I dissolved some of the assumed Cd in sulfuric acid. There was a vigorous reaction, and the solution has turned slightly greenish-blue (copper?). Thing is, I don't want a cadmium-plated object, I want cadmium! Perhaps a very small surface-area of the electrodes would make a decent-sized plate that can be removed, but I'll have to find some thiourea and possibly break apart some more batteries first. You can reduce cadmium solution to cadmium powder/crystals using zinc. You might want to dissolve the cadmium in copper sulphate, as copper (impurities?) would not dissolve. I don't understand - the cadmium solution would dissolve into a copper sulfate solution? Cadmium metal? Cadmium metal in copper sulphate solution. Enough with these poxy gram quantities: Cadmium Yellow is a fairly OTC pigment. Amazon UK lists it. Have an adventure and convert the sulphide to metal! That's all very well and good, but how do I know it's the real deal? Any old paint supplier can claim 'Cadmium Yellow' or 'Cadmium Red'. They'd be breaking the 'Trades Description Act' in the UK, if it wasn't the real thing. Density of the product would be a good indicator of what it is. With lead chromates now phased out, any yellow substitute pigment is likely to be much less dense than actual CdS. You can also ask the seller: insist on a return/refund if it isn't what was advertised. Update: Decided to try the battery route again, because all pigments in the area that contain cadmium are really expensive. I took apart 1 battery, deciding to melt the gray powder inside it under KOH. This (sort of?) worked: There was a tiny (1mm) blob of molten cadmium at the end, which welded to the container, but everything was mostly brown mush. I then decided to dissolve this and the contents of another battery in sulfuric acid (lacking HCl at the moment), which is where I am now. Everything seems to be reacting smoothly. My plan is to precipitate cadmium hydroxide, which will then be re-dissolved in pure HCl to yield cadmium chloride, which will be electrolyzed to yield cadmium. Hve you considered nickel impurity's? You'll know if the solution turns green when it reacts with sulfuric acid. Which is what happened to mine. If you think about it, it only make sense, there are nickel atoms in there somewhere, and if you dump all the contents except the steel mesh, then you've dumped the nickel too. [EDIT] They will be hard to separate the salts because nickel and cadmium sulfate and chloride have similar solubility's. EDIT: Never mind - electrodeposition of cadmium metal went much faster and easier than I intended. I used a 6V lead-acid battery, and my carbon cathode is already covered with a thick layer of metal, unless I'm seeing things in the cell liquor. Also, the solution went from a very, very light green to clear/straw-colored upon boiling in more cadmium. How did you electrodeposit it? Re-Edit: Apparently there are some tricks to melting cadmium. I used KOH, along with some re-deposited cadmium - it looked the exact same as the old stuff, and plated out really quickly, allowing me to do this experiment in just under 2 hours (from battery to finished product). The trick is to constantly 'poke' the cadmium with something, and be ready to take it off quick - no more than 5 minutes of molten KOH! Another element for the collection, and I look forward to never doing this again. EDIT: @Zyklonb: I dissolved the battery stuff in plenty of sulfuric acid, and used carbon electrodes (one of which eroded very quickly). As mentioned, the power source was a 6V lead-acid battery. The cadmium metal is a gray, fluffy powder (same as what went in, really). This was dried, pressed with a paper towel, and promptly chucked into the melt.